The inspiration for this item came from German scientist Dr Joachim Scheven, initiator of the German Creation Museum Lebendige Vorwelt. 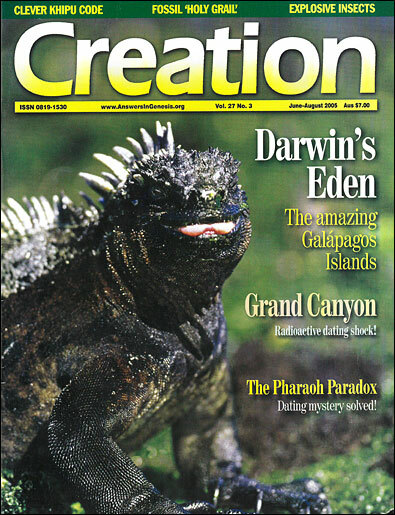 Most of the photos in this article were taken by his daughter Esther during a Galápagos scientific expedition in 2000. We are extremely grateful to Lebendige Vorwelt for permission to reproduce them. The Galápagos are a small group of volcanic islands about 950 km west of Ecuador, which regards them as its territory. Long known for giant land tortoises, they were once called the Tortoise Islands. The name Galápagos comes from an old Spanish word for a type of saddle,1presumably because of the saddle-like shape of some of the tortoises’ shells (see photo, right). In 1835, towards the end of his five-year voyage on the ship Beagle, Charles Darwin made many observations on the fascinating and unusual creatures living on these islands. In fact, the Galápagos Islands are often called the ‘showcase of evolution’. Many are convinced that they contain living proof of the belief that all living things have evolved from much simpler forms over millions of years. But the facts about the animals of the Galápagos do not compel belief in goo-to-you evolution at all. Rather, they make excellent sense in a framework of biblical history. The link with Darwin and the theory of evolution has always been good for Galápagos tourism. However, this June, the Ecuador Government is seeking to capitalize on the islands’ fame more than ever before by hosting what it calls the ‘World Summit on Evolution’ (see box below). These islands are, without question, a naturalist’s delight. When the expedition commissioned by well-known German creationist scientist Dr Joachim Scheven visited them in 2000, he wrote that every visitor is struck by the astonishing lack of the ‘fear of man’ in its native animals. Introduced species, such as feral dogs, cats, goats and pigs shy away from people. But surprisingly, the native animals, including birds, have not learned to fear people—despite having had contact with them for at least 400 years, much of that time unprotected by legislation. This suggests that the fear of man is not learned, but may be largely programmed genetically, like other instinctive behaviour. If the program is lost, e.g. during speciation,2 it won’t get ‘rewritten’ via experience. The 19–23 June 2005 evolution-fest known as the World Summit on Evolution, was meant to ‘remind the scientific community of the importance of the Galápagos Islands’ as well as to ‘promote Ecuador, its scientists and the country’s educational institutions’. The government website for this event proclaimed that this four-day meeting, on the Galápagos Archipelago, would bring ‘the world’s outstanding leaders in evolution’ together ‘face-to-face to share their insights’ on evidence for evolution and ‘to discuss future research horizons’. It would also be documented for live subsequent TV broadcasts. The invited participants included 200 scientists, of whom 50, in addition to 50 postgraduate science students, were Ecuadorian. Some six months before the event, the website promised heavy evolutionary indoctrination of the country’s schoolchildren as part of the leadup. This included a tour of Ecuador by 30 ‘leading national and international scientists’, working in classrooms and conducting special ‘training and staff development’ activities for hundreds of Ecuadorian teachers, and 5,000 school students participating in ‘debate, exchange and workshops on themes of Evolution … also open to the general public’. 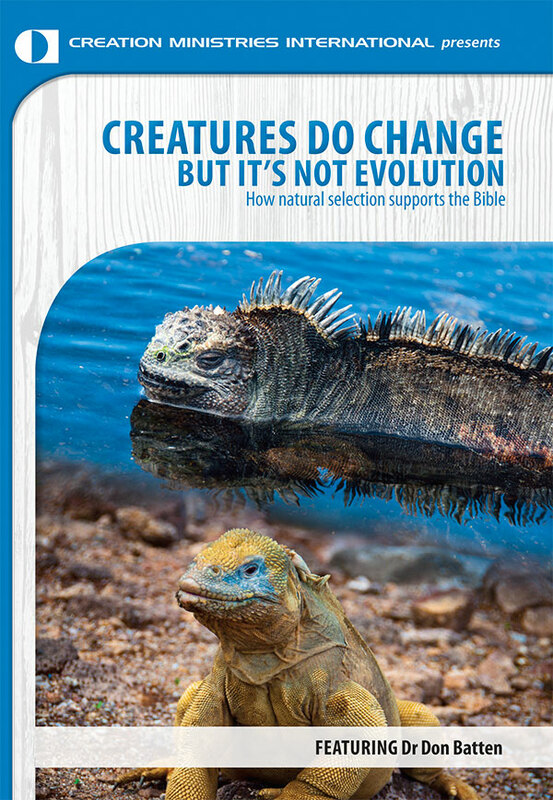 The site also boasted that the ‘proceedings of this conference will be the basis for the authoritative source on Evolution for the next decades’ and that science handbooks to be developed from it will be distributed to national schools. Interestingly, the same types of creatures on the South American mainland have the ‘normal’ fear of man. When animals first populated the Galápagos, much as Darwin envisaged, small ‘founder’ populations that made their way to the islands would naturally have carried only a fraction of the gene pool of their parent populations. This well-recognized phenomenon3 is one way of losing the genetic programming for this response. The fact that all the indigenous Galápagos species are involved, however, suggests something else. Perhaps mutations resulted in losses of information for a generalized fear response, well before man arrived. Such losses may have been heavily favoured by selection in this formerly predator-sparse environment. Whatever the reason, the Galápagos animals are ‘the exception that highlights the rule’. Virtually all over the world, creatures still display the truth of Genesis 9:2, proclaimed after the Flood: ‘The fear and dread of you will fall upon all the beasts of the earth and all the birds of the air …’. The classic story is that Darwin, a gentleman-naturalist perfectly willing to keep believing in divine creation, stumbled across irrefutable evidence opposed to it in the Galápagos. The ‘facts of nature’ left him no choice, as it were. The islands’ 13 different species of ground finch (called ‘Darwin’s finches’ to this day) play a major role in this legend. He saw that they were obviously from the same ancestral population (something modern creationists would mostly affirm), presumably from the mainland. Yet each was specialized to different environments, food types, etc. And this, we are told, forced him to abandon divine creation. Shades of Eden. This finch demonstrates the near-Edenic state of tameness of all birds and animals on this archipelago. The idea of divine creation held by many in Darwin’s day was more of a caricature of the Bible, in which all animals were created more or less where they are now. Whereas Genesis, of course, tells us that the world was repopulated after being devastated by the Genesis Flood. So, naturally, the Galápagos creatures were not created on the Galápagos, but migrated to them. there is no hint in the Grants’ observations of any of the characteristics of the finches arising as true genetic novelties—i.e., there is no evidence that mutations have generated the characteristics upon which natural selection exhibits its fluctuating pressures. In short, the finches do not show the slightest trace of an ongoing creative process which could have caused them to arise from non-finches, and these, in turn, from lesser creatures—all the way back to bacteria. Were the Galápagos once connected to the mainland? The giant land tortoises9 found on these islands can’t swim; they may at best survive, floating helplessly, for several days in the ocean. If they did float to a nearby island that way, they would generally be seriously injured or killed by being dashed against the rocks. So how did they get to this archipelago from the mainland, some 900 km (550 miles) away?10 The fact that each of the islands of the Galápagos (apart from Isabela) has only one strain of tortoise indicates that there has not been any ongoing ‘tortoise exchange’ between them. Although current belief is that the volcanic islands of the Galápagos arose individually, and were never connected, some researchers have suggested otherwise. If the entire archipelago was indeed once connected over a much larger area, it makes sense of the evidence. All it would take is one strain of land tortoise to have arrived there at some time after the Flood,11 and then as the main section of land sank in post-Flood earth disturbances, the volcanoes would have become separate islands. Each isolated turtle population would have carried different subsets of the total gene pool, and could also have been subject to different selection pressures. A marine iguana of the Galápagos is shown here feeding on algae at low tide (see cover of this issue for closeup photo). Highly adapted to life by, and in, the ocean, it is capable of diving into seawater to feed on algae at a depth of several metres. It is known to hybridize with the land iguana, so is likely the same created kind. This high degree of adaptation/specialization suggests that the original iguana gene pool must have incorporated a wide range of potential behaviours/capabilities, finetuned by natural selection. As we have seen from the Grants’ Galápagos finch research (and other observations), such genetic changes within the kind can take place very rapidly—even to the extent of the variants no longer freely interbreeding with each other. This means that they are, technically, a new species, despite no new information having arisen.14 The stunning (to evolutionists) speed of such observed variation/speciation is consistent with the earth movements described here having taken place since Noah’s Flood in about 2500 BC. The distinctive varieties of tortoises on each of the islands tend to have unusually long necks. This is particularly suited to being able to reach the cactus fruits on these dry islands. No doubt natural selection played a role; animals with the genetic information for longer necks would be more likely to survive, especially in droughts. This is no more evolution than in the case of the finches, already discussed. But there is more; the way in which some of the strains have a raised front edge to their carapaces (shells), giving them a saddle-like appearance (see photo at top of article). This is an advantage, too; it allows them to extend their necks even more. However, the same saddle shape is present in four of the tortoise races; on the north of Isabela, on Pinta, Pinzon and on Española. The idea that the genetic program allowing for this variation (which was then favoured by selection) was already in the original tortoise line is consistent with Genesis creation history. It is also far more probable than the alternative, neo-Darwinian idea, namely that the same shape (necessary before selection could act) was created by random mutations occurring by chance on four separate occasions! Darwinists have long muddied the waters, sometimes deliberately, on the issue of natural selection. The Galápagos Islands, with their unique and isolated environments, truly are a remarkable living showcase of the results of rapid selection pressures during post-Flood migration. We have seen that the facts, as such, do not support the antibiblical notion (evolution) that everything has formed itself from simple beginnings over millions of years. Sadly, these islands, and their superbly designed creatures, are being marketed to millions as ‘proof’ of Darwin’s idea, when the reality is far different. The flightless cormorant, one of the many species endemic to the Galápagos Islands, is nevertheless highly skilled at swimming and diving for its food. Restricted to a handful of coastal sites, its fishing expeditions do not cause it to venture much more than 100 metres offshore. So how did cormorants first arrive here? The most likely answer is that its ancestors could fly. In a fallen world, the loss of the ability to fly through mutational degeneration would be a disadvantage in the struggle to survive. However, on islands, things may not be that simple. Those cormorants which could fly would be more likely to be blown out to sea and thus not pass on their genes to birds remaining on the island.1 So, in time, the ‘flightless’ condition would spread throughout the remaining cormorant population. The fact that a defect (a loss or corruption of genetic information, i.e. a mutation) can be a survival advantage is cold comfort for Darwinists, however—as it is in the very opposite direction to the sort of change required to give credibility to their claims.2 They maintain that the complex design information involved in flight arose in the first place by random chance filtered by selection. Yet examples like the flightless cormorant do not show such information being built up. Rather, they suggest that it has been corrupted or lost. Beetles on windy islands are also usually flightless for the same reason. See Wieland, C., Beetle bloopers, Creation 19(3):30, 1997. Wieland, C, The evolution train’s a-coming (sorry, a-goin’—in the wrong direction), Creation 24(2)16–19, 2002. Probably related to the Spanish word galope meaning ‘gallop’. A downhill, non-evolutionary process in which one species splits into two, each with less genetic potential than the parent population. If the islands were indeed once part of a larger landmass (discussed under the section ‘Were the Galápagos once connected to the mainland?’) then land animals cut off by water as this sank would exhibit a similar effect, only they would be ‘remnant’ rather than ‘founder’ populations. According to his own notebooks, as revealed by Stephen Jay Gould. See Wieland, C., Darwin’s real message: have you missed it? Creation 14(4):16–19, 1992. Deists believe that a god of some sort originated the laws of the universe—setting matter into motion, possibly even instituting universal moral laws, but not being concerned (or interfering in any way) with the world thereafter. Grigg, R., Darwinism: it was all in the family, Creation 26(1):16–18, 2003. Darwin’s father was also an agnostic/rationalist unbeliever. They probably played some role in the refinement and development of his ideas well after his Beagle voyage. Wieland, C., Darwin’s finches, Creation 14(3):22–23, 1992; Wieland, C., Book review: The Beak of the Finch, Journal of Creation 9(1):21–24, 1995. Genus Testudo; divided into subgenera such as Geochelone in South America, though with controversial justification. The remains of similar creatures are found on other islands, too—notably the Seychelles, Cuba and Mauritius. Large rafts of torn-off vegetation, e.g. from storms and tsunamis, would be capable of transporting land tortoises, though it would seem statistically unlikely that it happened individually to each island. Batten, D. (Ed. ), The Creation Answers Book, Creation Book Publishers, chapter 18, How did all the different ‘races’ arise? 2004. This is not original, but was suggested by the most thorough researcher of the Galápagos tortoises, John van Denburgh, in 1914—see Leben 12:5, October 2000. Catchpoole, D. and Wieland, C., Speedy species surprise, Creation 23(2):13–15, 2001. Grigg, R., Darwin’s illegitimate brainchild, Creation 26(2)39–41, 2004. Wieland, C., Muddy waters: clarifying the confusion about natural selection, Creation 23(3):26–29, 2001.